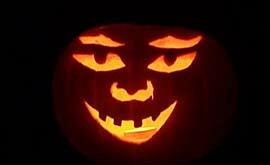 The Wabash College chapter of Alpha Psi Omega, the national service fraternity, is hosting an event this Sunday afternoon for families to gather for some pre-Halloween pumpkin carving. APO members will provide free pumpkins and furnish carving tools, while providing assistance and supervision for young people. 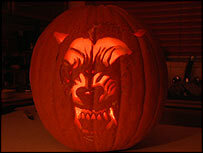 APO will make available 200 free pumpkins weighing between 10 and 16 pounds on a first come, first served basis. APO members will also serve refreshments. "Why not end Daylight Saving Time on a good note and spend the extra hour with your family," said organizer Tim Rickard. "Pumpkins are free to the public and everyone is welcome to this year’s pumpkin carving event." The pumpkin carving celebration will take place from 4:00 p.m. to 6:00 p.m. this Sunday, October 29 on the Wabash College campus. If the weather is good, APO will be set up in the Grant Avenue parking lot near Center Hall. If it’s raining, carving will take place underneath the main bleachers of Hollett Little Giant Stadium with parking on Jennison Street.